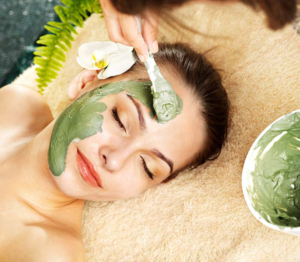 Our customized facial can be suited to any skin type—including Oily, Dehydrated, Aging, or Combination. Our skilled aesthetician performs advanced clinical-grade facials that can help your skin look its best by addressing individual skin concerns. After a skin analysis, each facial is customized tailored to the client’s skin needs and skin type. Specifically designed for sufferers of acne and frequent breakouts, this treatment attacks existing blemishes with a thorough cleansing to remove acne-causing bacteria. A deep exfoliation to unclog pores in addition to antibacterial cleansing, detoxifying clays, and blemish- fighting masques help prevent future breakouts and leaves the skin soft and smooth. Additional extractions are then performed and even the most stubborn comedones are gently removed. Depending on your skin needs, proper Guinot or G.M. Collin skincare will be used. We address the skincare concerns on your back and posterior shoulders, as we would on your face. Our product’s active ingredients will leave you with incredibly soft and smooth skin. Each session includes cleansing, exfoliation, extractions, moisturizing and a selective masque specially formulated for your appropriate skin issue. We customize each treatment to help exfoliate dead skin cells and provide nourishment to allow your skin to be healthy and beautiful. Depending on your skin needs, proper Guinot or G.M. Collin skincare will be used. Using a dermabrasion peeling, pro-Collagen and Hyaluronic acid, the Age Summum treatment is an alternative to plastic surgery, significantly reducing the signs of aging (wrinkles, fine lines, loss of firmness and lack of radiance). Surface of the skin looks more youthful. Wrinkles and fine lines are immediately smoothed away. The skin’s texture is refined and regains a radiant glow. An unique skincare treatment method that provides global firming action and immediately attenuates signs of fatigue and ageing in the face, neck and décolleté. Upon completion of the treatment, the skin is instantly firmer, more youthful looking and fine lines are minimized. Turn over a new leaf in less than an hour. Beaute Neuve is a treatment which removes the dead cells responsible for dull complexions and reduces the appearance of brown spots. Deep exfoliation with natural fruit acids to rejuvenate the skin and reduce the appearance of enlarged pores. Brings back radiance and lightens pigmentation. Extremely rich in active ingredients, this customized combination of essential oils and plant extracts are selected to meet the skin’s needs; provides a soothing effect while delighting the senses. You will feel incredibly relaxed and your skin will regain its suppleness, radiance and softness. G.M. Collin is dedicated to offering women and men of all ages an exclusive range of products, from superior performance clinical treatments to the highest quality dermo-corrective home care. The goal, no matter what the product, is a more radiant, healthier, younger looking skin. G.M. Collin’s signature age-defying treatment. This relaxing treatment session offers pleasant textures and exquisite essences delivering an overall sense of well-being. An ideal treatment for people determined to mask the signs of aging. Collagen 90-II is an exclusive, highly respected and sought-after age defying skin renewing treatment that hydrates, smoothes and tones wrinkles to combat the visible signs of aging. For all skin types. A powerful age-defying skin care designed to delay the visible signs of aging and energize the skin. This treatment is exceptional for both pre and post-sun exposure. Ideal for people who live in urban areas with high pollution levels. A clinical treatment that includes four progressive steps that work in synergy to cleanse, hydrate, revitalize, and firm the skin. Perfect before a special event, wedding or public appearance. Improves the appearance of lines and wrinkles all skin types. For all skin types. A hydrating clinical treatment, creating a cooling effect on the skin to revitalize, moisturize, and soothe. Its thermo-cooling effect on the skin makes it a remarkable revitalizing treatment particularly for reducing the visible appearance of redness. Offers instant radiance and long lasting hydration. For all skin types. This revolutionary treatment is designed to clear skin, help control acne pimples and revitalize fatigued, stressed and dull skin. A 5-step treatment, purifies and deeply hydrates to restore the skin’s natural radiance and glow. All products are color-free, paraben-free, alcohol-free, and fragrance-free. The delicate eye area requires special care, if it is to remain looking bright and beautiful.This treatment visibly decreases dark circles and puffiness. Also, it minimizes the appearance of expression lines and wrinkles. A must have for all ages to hydrate the delicate eye area, smooth lines and wrinkles, improve elasticity and reduce the signs of fatigue. A great fix before a special event or simply when eyes look tired to revitalize the most looked at feature!